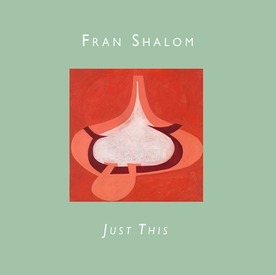 For Fran Shalom, painting's job is defining shape, color and light within an established format: a wood panel as small as 12” x 12”, and as big as 24” x 30”. Fran Shalom uses shape to contradict itself, to confuse the viewer’s eye and mind. Her use of shape is an uneasy amalgam of cartoonish, somewhat figurative forms and minimalist clarity. My eye addresses her work, caught between remembered references to cartoons and the more abstract pleasures in the shapes of an Ellsworth Kelly painting. Sometimes forms in the middle of her paintings – in one instance a bridge, in another a harp – seize my attention. But the knife-like clarity of her paint application refuses to let me sink completely and comfortably into singular interpretations. The power of her paintings’ clean, blank shapes won't let me rest within any figurative fantasy of a picture. I accept instead the existence of multiple visual readings within the small format of her paintings. The uneasiness of these different readings keeps my eye and mind on the conundrum: what am I looking at? The color Fran Shalom uses is not coded. It feels deeply considered and specific. Her color is both pleasing and irritating: it displays light and dark. Her color holds shape and relationship, and is a workhorse. It often appears brilliant. But isn't that a nasty old green? And what about that brown? Light is created by color, and by shadows lurking beneath the paintings’ primary shapes. Assured shapes are layered on top of failures, those earlier versions that became extinct for the sake of the present painting. But her failures are never completely denied; instead they become part of her paintings’ textures, and they hold light. Her layered grounds vie with the top-most shapes, sensually refusing the position of background. Fran Shalom’s paintings are a love of painting itself. She loves painting. Is that all? That's ALL! Nancy Shaver is an artist and owner of Henry, a store in Hudson, NY.